Here is a map taken from the Journal of the Polynesian Society, that shows some interesting names and locations. Unfortunately, there are few errors - the area about present day Thames township is Ngāti Maru territory. 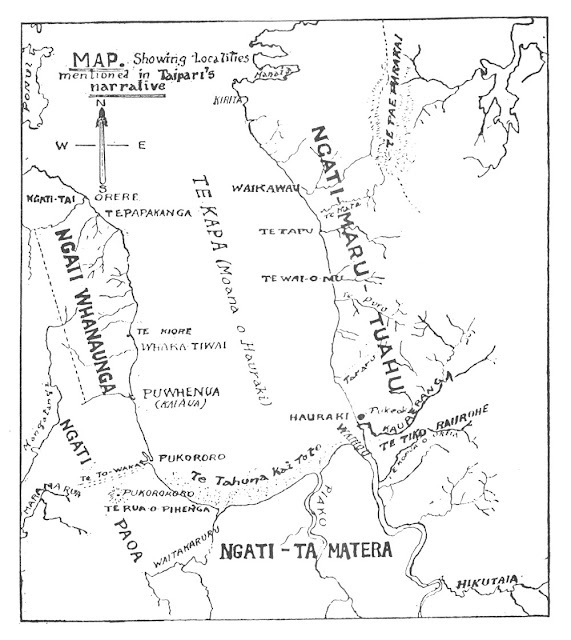 The area immediately to the north and along the coast is a takiwā of Ngāti Tamaterā (Waikawau block). The area of land labelled 'Ngāti Tamaterā' is part of the Ngāti Pāoa rohe adjoining Ngāti Maru adjacent to the Waihou River. Taken from 'Pare Hauraki and Pare Waikato' by George Graham in Journal of the Polynesian Society, Volume 58, No.2, 1949, pp. 68-76.